A number of years ago a popular tv show aired in Japan featuring a legendary ramen chef, colloquially nicknamed “Ramen Devil”, taking aspiring ramen chefs under his wing and teaching them how to make and run a successful ramen shop. Sano Minoru (佐野実), or “Ramen Devil”, gained a huge following after his appearance on the show and his ramen has been highly regarded ever since. Unfortunately, Sano-san passed away in early 2014, but one of the chefs mentored by Sano Minoru is still operating in a shop a few minutes from Saginomiya station. Ramen Sugimoto, started by Sugimoto Kosuke, opened its doors in 2013 with much anticipation from ramen enthusiasts all around Japan. High hopes for Sugimoto began before it even served its first bowl thanks in part to Sano Minoru himself endorsing the shop on his blog. Since that first day, Sugimoto has preached the teachings of the late Sano-san and has been serving up some of the best ramen in Tokyo. The thing that surprised me most about Sugimoto when I arrived was how spacious the restaurant is. I guess this should have been assumed as it is located quite far from central Tokyo, but even so, they have a nice spacious counter with table seating in the back. Before you sit down however, buy your ticket at the machine. The ticket machine looks a bit intimidating, but they actually have a pretty simple menu. The first row consists of their Shoyu Ramen and their topping varieties, second row is the Shio ramen, third row is the Shoyu Tsukemen, and the fourth row is the Shio Tsukemen. The first column is the regular ramen, second column is with the soft boiled egg, third column is with won tons, fourth column is with char siu roast pork, fifth is the Tokusei (or all toppings), and the last row is for extra noodles. The fifth row includes the extra toppings if you wish (corresponding to the column) with the first column being extra chicken char siu. The bottom left includes the rice bowl options of chicken char siu over rice or roast pork char siu over rice. On this particular visit I opted for the tokusei versions of the Shoyu and Shio Ramen with a side order of roast pork char siu. First up is the Shio Ramen. The broth style is rooted in a traditional Chuka Soba style using Japanese chicken and pork as its base with scallops, a variety of vegetables and a bit of Niboshi added to round out the flavors. The shio tare was very flavorful, giving a nice salty and savory flavor profile to the soup. When you first take a sip of the soup however, you’ll be immediately hit with the smoky chicken oil that coats your mouth. It’s a bit intense as is, but pair the soup perfectly with the noodles. The Tokusei version comes accompanies with three different char siu styles (chicken and two pork), two won tons, a marinated soft boiled egg, menma bamboo shoots, minced scallions, and blanched mustard leaves. I have no complaints about the toppings which were all prepared perfectly. The soft boiled egg was cooked to a silky smooth finish, won tons pillowy and soft, char siu tender to the bite, and mustard leaves blanced and shocked in ice water as it should be. To be honest however, the won tons were not my favorite with Yakumo and Shibasakitei serving up unbelievably good versions, but it was definitely better than average. The char siu was similar in that they were all way better than average, but not as good as some of the best I have ever had. What differentiates the bowl however is the fact that no shop has attained that level for each and every component. 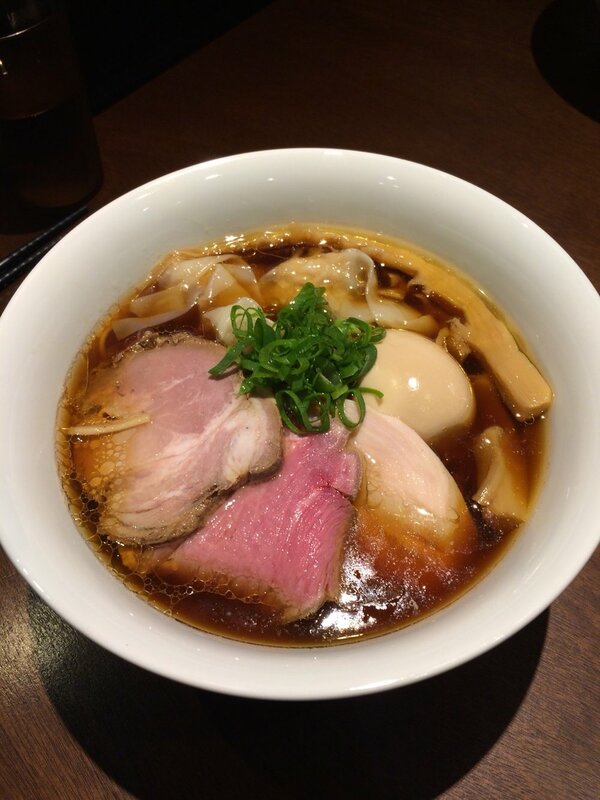 It is one of the best complete bowls you’ll have in Tokyo. Before moving on to the Shoyu Ramen, I had a bite of the pork char siu rice bowl to cleanse my palette. The weakest point of Sugimoto is this rice bowl which is saying a lot since it really doesn’t have much to do their ramen. The pork char siu, as I mentioned earlier, is nothing that wows me. It is definitely a lot better than most places, but I felt like a lot of small things could have been done to make it better. When eating each piece individually, you can tell that they charred the edges a bit before soaking in their marinade. This could just be my preference, but I feel like the char siu, especially on a rice bowl, tastes better when charred individually per order right before serving. You get a nice smoky aroma while warming up the pork a bit and it makes its pairing with the rice perfect. Other than that, this is a good bowl. The shoyu tare is light enough where there is a lot of flavor without altering the pork which is already marinated and the green onions are nicely shocked to give a great color contrast to the bowl and crunch. As it is just pork and rice, its not anything that’s gonna change your meal spectacularly, but is a great filler if you’re hungry. I’m usually a fan of Shio ramen when given the option, but I must say, the Shoyu is the best bowl here. It’s quite reminiscent of the shoyu ramen from the “Ramen Devil” Sano-san himself, but is quite a lot better due to Sugimoto’s use of such great quality ingredients for the broth. The soy sauce blend really enhances the broth as well as adding another depth of flavor to the toppings that the Shio Ramen just couldn’t do. The shio tare was just not as flavorful as the shoyu to give the bowl the flavor punch it needed. When describing the shio ramen I mentioned how it didn’t wow me, but the Shoyu definitely bumps it up a notch. The won tons needs the extra umami and saltiness the shoyu provides as well as the three char siu varieties. I think the chicken oil is also enhanced by the shoyu tare and since it coats every noodle while eating, you can definitely distinctly tell the difference between the two bowls. If you had to get one bowl here, definitely Shoyu takes the cake. Of course I haven’t had the tsukemen varieties yet, so I may have to edit this review in the future, but give it a try and have a look yourself. The shop is a bit far from central Tokyo, but if you’re staying in Shinjuku, it is just one train away so it might be worth a visit. You won’t have the insanely long lines like that ones you’ll find in Shinjuku, so you actually may end up saving time by coming to Sugimoto. It’s definitely more highly regarded by Japanese ramen enthusiasts than most of the shops in Shinjuku so you may think so too. And even after all that, it might be worth it just to be a part of ramen history and culture. One of the last remaining shops with “ramen devil” experience and who knows how much longer they’ll remain.